A team of Italian researchers analysed radar data taken between May 2012 and December 2015 with an instrument on board the European Space Agency’s Mars Express spacecraft, according to a new paper. Parts of the ice returned strange signals in the instrument. 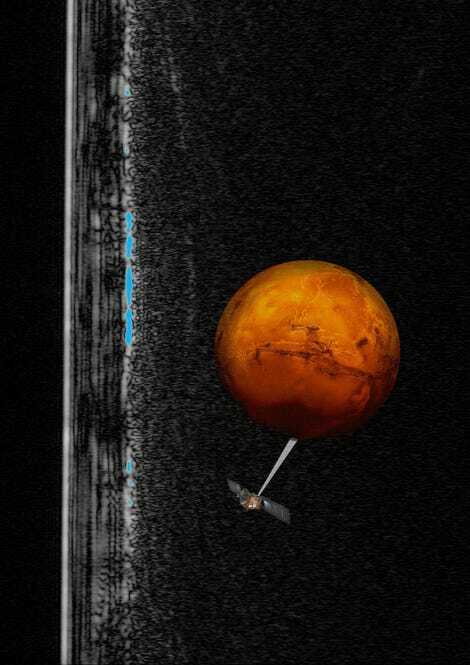 From May 29, 2012 to December 27, 2015, the MARSIS (Mars Advanced Radar for Subsurface and Ionosphere Sounding) instrument on board the Mars Express spacecraft took data on a 200-kilometre-wide (124-mile) area near the planet’s south pole. It shot radio waves at the ground, then recorded how the waves that bounced back had changed. There was nothing strange about the area itself. But a 20-kilometre-wide (12-mile) region beneath the surface seemed to reflect way more of the radar signal than its surroundings.